Many cultures and religions contain some concept of demonic possession, but the details vary considerably. Although the collection known as ‘The Old Testament’ contains few references to it, the ‘New Testament’ contains many; indeed Jesus could reasonably be regarded as a travelling theraputic exorcist. Signs and symptoms of possession have varied, but convulsions were a staple at the height of the European possession hysteria in the sixteenth and seventeenth centuries. The ‘possessed’ nuns at Louviers and at Aix-en-Provence performed lewd movements and grotesque contortions. In Salem in 1692, children Betty Parris and Abigail Williams had fits which included peculiar positions. Jane Throckmorton, child and putative victim of local ‘witch’ Alice Samuels in Warboys in 1593 suffered from bodily movements which included: “… to swell and heave up her belly so as none was able to bend her or keep her down”. The positions accomplished by demoniacs were so extreme and unusual that they often helped to persuade onlookers that a powerful and malignant supernatural force was at work. How could anybody do, or want to do, this naturally? But as pioneering nineteenth century neurologist Jean-Martin Charcot (1825-1893) pointed out, identical contortions could be a sign the sign of the newly-identified medical condition ‘hysteria’. He started by proposing that hysteria was a neurological condition, but eventually came to believe that it was psychological in origin. 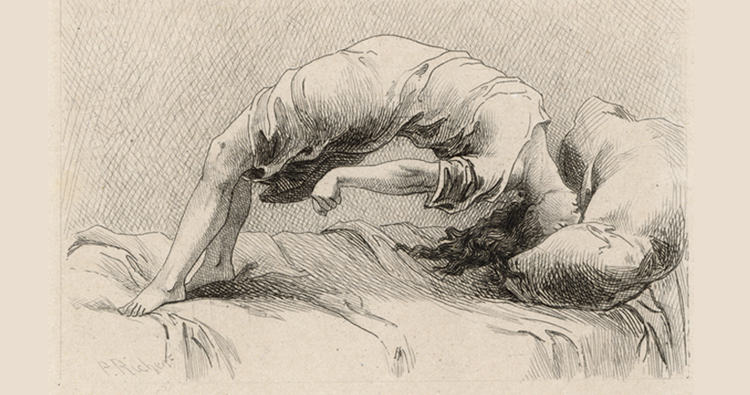 There what links the ‘possession’ of early modern Europeans, the ‘hysteria’ of Charcot’s nineteenth century patients and the ‘mania’ of modern patients? We could regard them all as a communal ritual with a script and roles for both onlookers, experiencers and authority figures. The underlying distress and urge to act-out could be similar in different cases, and expressed through different cultural lenses. Levack’s book does a good job of placing the possession performance in its proper cultural context and avoiding the temptation to apply a facile ‘mental-illness’ explanation where a more multi-faceted understanding is called for.